UEFA Awards for season 2017/18 and UEFA Champions League draw for new season 2018/19 has been completed on thursday. Voting for the winners was done by Champion League coaches and invited journalists across Europe. Real Madrid's Captain Sergio Ramos won the UEFA Defender of the season 2017/18, whereas his teammates Keylor Navas, Luka Modric and Cristiano Ronaldo won UEFA Goal Keeper of the season, UEFA Midfielder of the season and UEFA Forward of the Season 2017/18 consecutively. 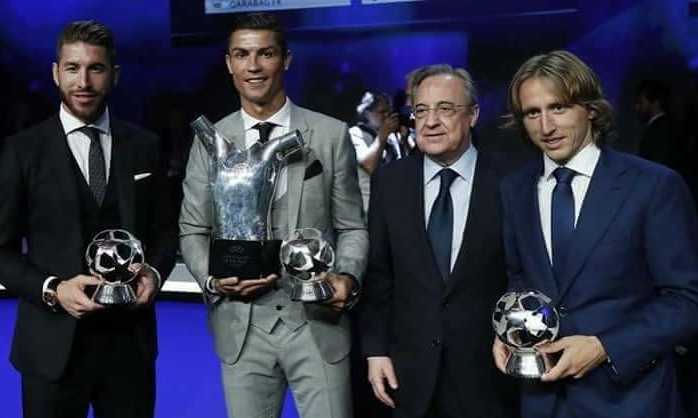 Luka Modric also claimed UEFA Mens Player of the Season 2017/18 ahead of Cristiano Ronaldo and Mohamed Salah. Danish and VFL Wolfsburg striker Pernille Harder was voted UEFA Womens Player of the Season 2017/18. The 32 year old Real Madrid and Croatian midfielder Luka Modric reached peak of his career this year. Luka Modric has just received UEFA Mens Player of the year 2017/18 along with Midfielder of the season 2017/18 on thursday. Luka Modric edged past former Real Madrid teammate Cristiano Ronaldo and UCL finalist Liverpool star Mohamed Salah. Luka Modric not only helped his club win 13th Champions League title, third in a row, but also helped his country Croatia reach to the Finale of FIFA World Cup 2018 edition as a captain. Croatia lost the finale to France by 2-4 and finished the campaign as runner-up. The Croatian international also won the FIFA World Cup 2018 Golden Ball. Sergio Ramos, captain of Real Madrid and Spain National Team, bagged UEFA Defender of the season 2017/18. The 32 year old captain played a very important role for his club Real Madrid to win their 13th UEFA Champions League title. No other clubs have ever won the UCL Title twice in a row. But Sergio Ramos's Madrid won it three times in a a row. played a vital role throughout the UCL Campaign and succeeded in winning his third Champions League Title. out to be a goal machine for the clubs he played. The 33 year old Cristiano Ronaldo is the highest scorer in the UEFA Champions League with 120 goals. He is also the highest assist provider in the UEFA Champions League with 34 assists. After Portugal's departure from FIFA World Cup 2018, Crisitiano Ronaldo moved to Juventus in a world record fee of 100 million Euro to be received by any player above 30 years old. The 25 year old Danish and VfL Wolfsburg striker, Pernille Harder was awarded UEFA Womens Player of the Season 2017/18 ahead of Ada Hegerberg and Amandine Henry. Harder was the top scorer of Bundesliga last season. She is also included in UEFA Women's Champions League squad of the Season 2017/18. David Beckham was awarded with UEFA Presidents Award 2018 for his outstanding achievements, professional excellence and personal qualities on and off the pitch and even after retirement from football. The 43 year old English National player retired from football in May 2013. He has played with different clubs over different continents like Manchester United, Preston North End, Real Madrid, Milan, LA Galaxy and Paris-Saint-Germain. UEFA Champions League draw for new season 2018/19 has also been completed as well.